What Are Those Bees Doing? This is yet another post in which I attempt to catch up on the wealth of observations from the summer’s flax project. In this post I will share a lot of photographs of bees. Photographing bees and other flying insects isn’t easy. However, my certainty that bees visit flax blossoms was the main reason that I was worried about cross-pollination when I was setting up my USDA seed project this spring. It’s the reason I covered the plants, even though flax is considered self-pollinated. I’m not sure what bees and other insects are doing, exactly, when they visit flax flowers. I just know that they do. 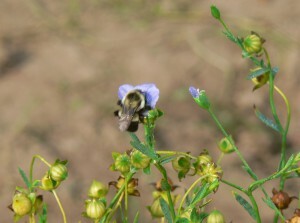 Here’s a bee visiting a flax flower on July 29, 2015.